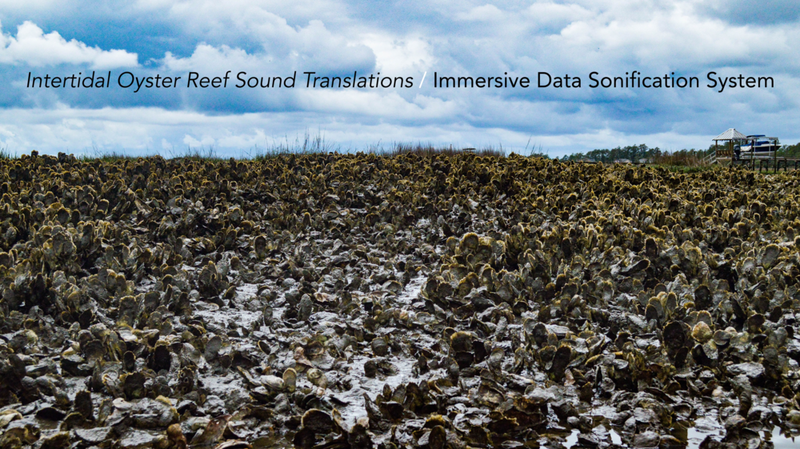 An immersive sound model of an intertidal Virginia coast oyster reef made using hundreds of hours of stereo hydrophone recordings. Using these recordings as data, four frequency sub-bands are analyzed and segmented to generate events with different intensity, directionality, and duration. These events are tagged by their location in the tide cycle (e.g. 0.5 is halfway through the tide cycle; high tide) and used to train a Markov model. After selecting or dynamically changing a “tide location” variable, the 4-dimensional output of this model may be mapped on to different sets of sounds (using AcousMIDI), effectively recreating the biotic and abiotic activity of the oyster reef in any number of different sound worlds. This project was made in collaboration with Martin Volaric, UVA Environmental Sciences Ph.D. candidate, as part of a grant awarded from the Environmental Sciences department (Moore Award), completed as a summer researcher at the Anheuser-Busch Coastal Research Center, and its sister, marine biology-focused project is being presented at the 2018 Long-Term Ecological Research All Scientists’ Meeting and forthcoming in a marine biology journal.